Waiting is not fun. Waiting when you have somewhere to be is the worst, as anyone who has spent time trying to get from point A to point B on public transit can attest. This past summer, thousands of people spent hours in line or stranded on boats due to breakdowns on BC Ferries. The cause; an overreliance on reactive maintenance. It’s the same story for many public transportation systems around North America, including the New York Subway and the Massachusetts Bay Transportation Authority. Each one is plagued by aging assets that cause breakdowns and long repair times. These systems are being crushed under the weight of maintenance backlogs caused by unplanned maintenance. Unfortunately, unplanned breakdowns are part of the job for any maintenance team. When you’re dealing with challenges like stretching resources, chipping away at backlogs, preparing for audits, compiling reports and leaping over communication barriers, a balanced maintenance strategy often gets pushed aside in favour of putting out fires as they come up. But leaning too heavily on reactive or unplanned maintenance can have big consequences— from stranding thousands of vacationers on a boat to souring business relationships because of late or subpar product. Back to basics: What is preventive maintenance and why is it important? Preventive maintenance is often held up as the antidote to too much unplanned downtime, but this isn’t entirely accurate. There is no silver bullet for downtime. However, preventive maintenance can help reduce the chances of equipment failure by performing regularly scheduled maintenance (rather than just fixing something when it breaks). It’s the same idea as taking your car in for regular oil changes to preempt a total breakdown. So while it’s not the only answer to unplanned downtime, the goal of preventive maintenance is to plan maintenance as much as possible to keep assets healthier longer and optimize time and money. It can help break the vicious cycle that we described above—instead of burying maintenance teams under backlog, preventive maintenance helps teams get ahead of maintenance and increase reliability, boost production, cut down on costs, improve communication and improve health and safety. Luckily, when it comes to implementing a preventive maintenance approach, you’re not alone— there is a wide array of technology that can help teams establish a sustainable preventive maintenance strategy. CMMS software and mobile apps help maintenance teams easily keep a detailed and centralized record of all assets, equipment and work. It also allows them to schedule and track maintenance activities. A CMMS manages all maintenance activities during the operational part of an asset’s life—all the time that it’s working as a productive part of a facility. EAM software provides a view of an organization’s assets and infrastructure throughout its entire lifecycle, from creation or procurement, to disposal. This covers the design, construction, commissioning, operations, maintenance and replacement of equipment. EAM platforms often support other business functions, such as accounting and HR, in addition to maintenance. What’s the difference between CMMS and EAM? EAM systems are often favoured by IT and finance teams, while CMMS software is tailored for maintenance teams. Most modern CMMS solutions include simple, easy-to-use interfaces with intuitive work order creation, calendars, and reporting that reduce the number of keystrokes between the maintenance team and the job at hand. These elements give it an edge over EAM when working towards a preventive maintenance strategy. For a more detailed look at the differences between CMMS and EAM, click here. An APM solution ties many different and advanced software tools and applications together, like the Internet of Things (IoT) and artificial intelligence (AI), to improve the reliability and availability of assets, plants, equipment systems, and infrastructure. Tools, like IoT and AI, collect and coordinate data, integrations, visualization and analytics to continuously track the value and risks from current operations, inventories and production outputs by using real-time data. While APM might sound intriguing, it relies on a very complex ecosystem of platforms, software and technologies while collecting and analyzing mountains of data. Maintenance teams looking to build a solid preventive maintenance strategy are better off exploring solutions with features catering to their daily needs and routines. ERP refers to the systems and software used to manage day-to-day business activities, such as accounting, procurement, project management and manufacturing. ERP systems tie together a variety of processes and enable the flow of data between them. By collecting transactional data from multiple sources, ERP systems eliminate data duplication and provide data integrity. While they’re not maintenance software directly, ERP systems are part of the larger maintenance technology ecosystem. It’s important for your maintenance technology to be able to integrate with an ERP system to help keep accurate inventory levels, and keep your finance team in the loop. There are a host of other technologies that can help you build or improve your preventive maintenance strategy. These technologies can be utilized with or without the solutions mentioned above, and can address certain crucial elements of preventive maintenance. 3D printing can be valuable for creating spare parts that are needed, but not readily available, and build molds or tooling used in manufacturing spare parts. Embedded sensors on equipment can provide information about the condition and performance of assets, such as temperature, vibration and volume. The data is used to spot early stages of disrepair and prompt intervention. Virtual reality and augmented reality can help train new technicians and improve on-the-job performance. VR and AR allow technicians to practice in a safe environment, cut their learning curve, reduce the cost of training, and speed up repairs. Video transmissions are helpful in training circumstances and tricky repair situations while wearable technology allows technicians to scan equipment, relay messages, make notes, call for help, and access instructions from anywhere. 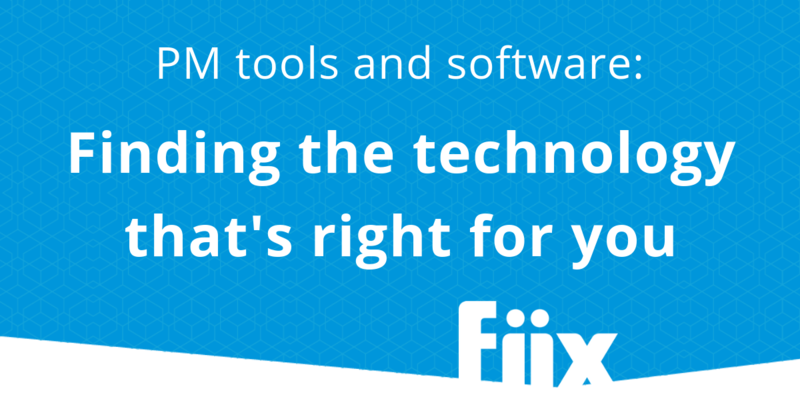 Conclusion: What preventive maintenance software is right for you? When looking for a preventive maintenance solution, it’s important to remember that just buying a system isn’t enough—you’ve got to get a system that will be used by the entire team. Without total buy-in, technology will not function the way it’s supposed to and the results will be underwhelming. That’s why every team needs to assess its needs, goals, budget and work culture to determine which technology or combination of systems will make the most impact.